SACRAMENTO — As severe winter storms continue across California, Governor Gavin Newsom today issued an emergency proclamation for the counties of Amador, Glenn, Lake, Mendocino and Sonoma to help communities respond to and recover from dangerous flooding, mudslides and damage to critical infrastructure. The Governor previously declared an emergency for 21 counties across the state due to storms. The emergency proclamations direct Caltrans to formally request immediate assistance through the Federal Highway Administration’s Emergency Relief Program and the Office of Emergency Services to provide assistance to local governments. WHEREAS under the provisions of Government Code section 8571, I find that strict compliance with various statutes and regulations specified in this order would prevent, hinder, or delay the mitigation of the effects of the winter storms, including those referenced in my February 21, 2019, State of Emergency Proclamation and those beginning on February 25, 2019. NOW, THEREFORE, I, GAVIN NEWSOM, Governor of the State of California, in accordance with the authority vested in me by the State Constitution and statutes, including the California Emergency Services Act, and in particular, Government Code section 8625, HEREBY PROCLAIM A STATE OF EMERGENCY to exist in Amador, Glenn, Lake, Mendocino and Sonoma counties. 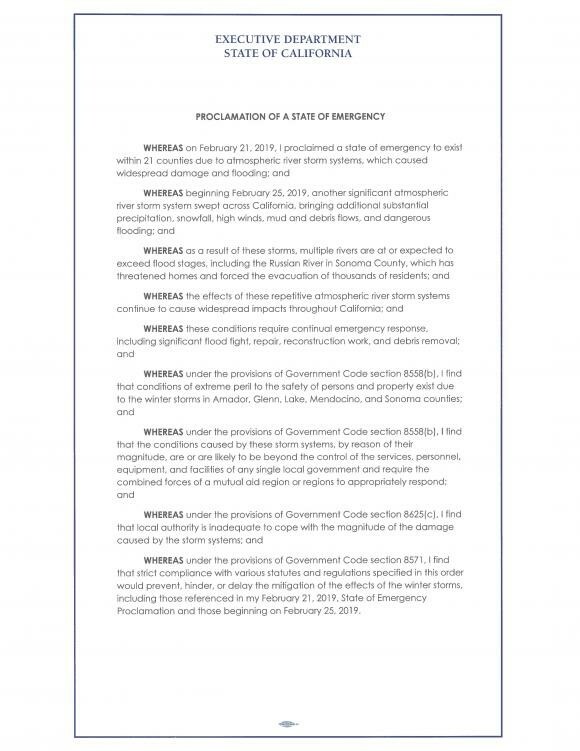 The provisions of my February 21, 2019, State of Emergency Proclamation also apply to Amador, Glenn, Lake, Mendocino, and Sonoma counties. 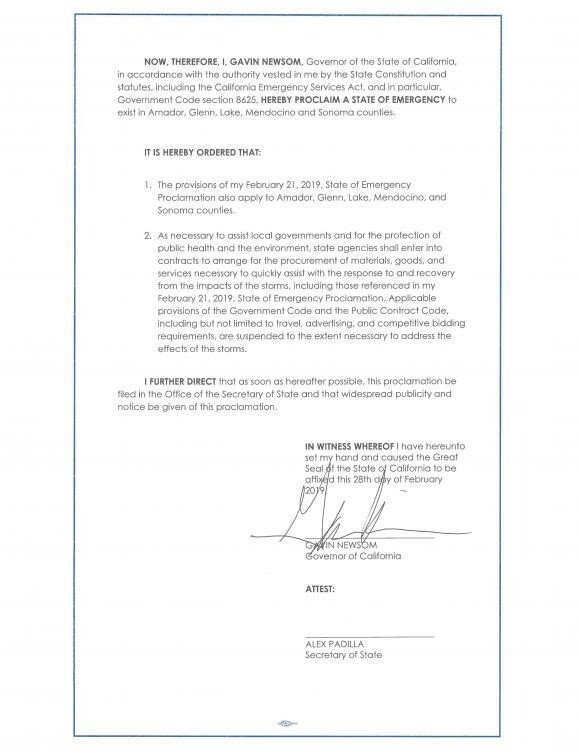 As necessary to assist local governments and for the protection of public health and the environment, state agencies shall enter into contracts to arrange for the procurement of materials, goods, and services necessary to quickly assist with the response to and recovery from the impacts of the storms, including those referenced in my February 21, 2019, State of Emergency Proclamation. Applicable provisions of the Government Code and the Public Contract Code, including but not limited to travel, advertising, and competitive bidding requirements, are suspended to the extent necessary to address the effects of the storms. IN WITNESS WHEREOF I have hereunto set my hand and caused the Great Seal of the State of California to be affixed this 28th day of February 2019.